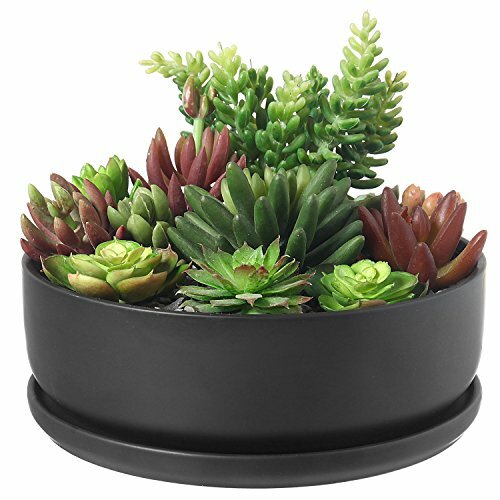 Providing both a versatile shape and unique color contrast for creative floral or succulent arrangements, this 8-inch round satin-black planter bowl adds a distinctive decorative accent to modern decors. The satin black finish offers a unique complement to contemporary designs and materials, while the shallow, round shape is an ideal setting for creative arrangements of stones, mosses, succulents and grasses, as well as candles, potpourri, and other decorative fill. A drainage hole at the bottom prevents overwatering, and the matching circular tray catches excess water from the planter. Create a striking look to accent indoor or outdoor spaces with this simple and elegant black ceramic planter bowl. Approximate Dimensions (in inches): Overall - 3 H x 8 D. Pot - 2.5 H x 8.0 D. Saucer - 0.5 H x 7.75 D.
A modern satin-black ceramic planter bowl with matching removable circular drain tray. Versatile satin-black finish provides a unique look to complement a variety of modern decors. Shallow circular shape provides an ideal setting for creative arrangements of stones, mosses, succulents, as well as candles, potpourri and other decorative fill.